Uncle John’s Crazy Town brings us a cool little Koko the Clown flipbook you can print, apparently from a book called Betty Boop’s Movie Cartoon Lessons. I hope he posts more stuff from the book! South Park iPhone App a No-Show in Apps Store; Cartman Blames Kyle’s Mom. Koko the Clown Flip Book! Facebook’s New Terms Of Service: "We Can Do Anything We Want With Your Content. Forever." A Fleischer Popeye cartoon to add to the Vintage Monkey Cartoons list. Read more about this cartoon on the Big Cartoon Database. A excerpt from a weird and ugly (but interesting) WWII propaganda cartoon made by inept and humorless nazis featuring Mickey Mouse, Popeye, Donald Duck, Goofy, Felix, and horrible Jewish stereotypes. I’ve seen a lot of WWII propaganda from the Allies, but not much from the Axis… presumably most of it was destroyed. If all their animation was this uninspired, it is no wonder we won the war. WARNING: This cartoon contains offensive ethnic caricatures. If offensive stereotypes bug you, you may not want to view it. Another cartoon for the ongoing Vintage Spooky Cartoons list… the Fleischers’ Popeye versus a ghost ship. Unfortunately, the only version of this available online that I can find right now is the colorized version. I’m not talking Ted Turner colorized either… bad as that is, this is much worse. My understanding is that at some point (around the time color television came around?) 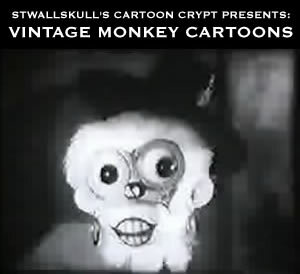 some brilliant entrepreneur decided it would be a good idea to make a buck by remaking some old public domain black and white cartoons in color by tracing cartoons on the cheap, coloring them and re-filming them. The results are poorly traced, and hideously colored, with far less “in-betweening” than the originals… leaving the animation a clunky, jerky, ugly mess… a hollow shell of the original. I imagine that they generally have chunks of the cartoon outright missing as well, judging from the budget-minded nature of this monstrous process (not to mention the sort of censorship that inevitably occurs when dimwits revisit the material of yesteryear and judge it by modern standards). In the very likely event I have any of this information wrong, someone out there please do correct me in the comments. Needless to say, I’ll replace this with a black and white version if it becomes available. Not only is this a spooky cartoon, but the heavy is a gorilla… what more could you ask for? 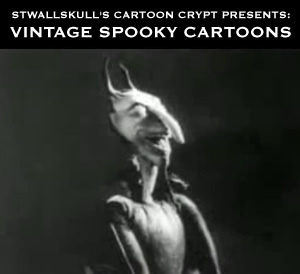 In eager anticipation of Halloween, here is a directory of the vintage spooky cartoons that have been compiled on this site so far. I’m going to be adding a lot more over the next month or so, so please do check back. Please note that you can subscribe to this site here to keep up with the latest posts. I’ve extracted the song Curiosity Killed the Cat (along with some of the rest of the soundtrack) as an mp3 which you can download here. Read more about Peeping Penguins on The Big Cartoon Database here. Here’s another wonderful and weird Fleischer Color Classics cartoon. This one has a fantastic soundtrack featuring Smiley Burnette’s song Mama Don’t Allow No Music Playing Round Here. I don’t know who performs it in the cartoon… if you do, please let me know in the comments and I’ll update this post. I’ve extracted the song to an mp3, which you can download here. Unfortunately, the print of this one is particularly beat up, so it is only included in the “Lost Episodes” documentary on the disc rather than being easily available from the main menu. 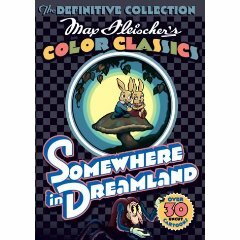 Here’s another wonderful and weird Fleischer Color Classics cartoon.